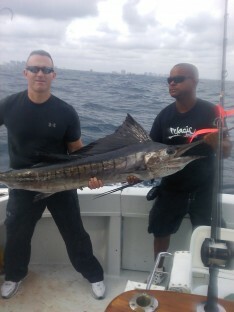 Fishing in Fort Lauderdale FL aboard the Happy Day Today with the Topshotfishing Team, Derek Neppo and wife from Rhode Island, chartered us to catch a Sailfish. We had a brisk wind from the east northeast at 12-15 mph, seas running 3-5 ft., pushing the dark blue indigo waters into 60 ft. of water off of Fort Lauderdale FL. We left the marina, to travel out to our drop off, which is 1.8 miles from the shore at the sea buoy putting the lines in the water within 15-20 minutes. We had a dozen Goggle Eyes in our bait well, with intentions of flying the kite. As I headed towards the sea buoy, I noticed that there was no current. The rule of thumb is “little or no current, position yourself over an artificial wreck or some type of structure”. Artificial wreck/structures will hold the bait and in return predators have a place to feed. I set out two kites with two Goggle Eyes on each kite and one down deep – we sat and waited for the Sailfish’s arrival. After an hour and half sitting on top of the wreck, I made a move to another artificial wreck, putting out the same setup. Ten minutes into it, the Sailfish made his appearance. Right long kite!!!! Dorsal out of the water, feeding on the live Goggle Eye, not making any movement, we waited for him to make his first mistake. Finally, he started walking off with the bait at a slow rate which soon accelerated. All of a sudden he jumped out of the water, showing his neon gleaming body. The Sailfish took off, and crossed over the other lines. Jackson, our mate, untangled the lines allowing Derek to fight the fish. Twenty-five minutes later, the Sailfish was at the side of the boat – pictures were taken – then the Sailfish was released and swam away.